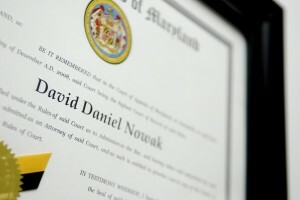 David Nowak was born and raised in Baltimore. He attended Calvert Hall College High School in Towson and graduated from Towson University with a B.A. in international studies. After spending five years as a securities analyst for a Fortune 500 financial firm, he attended the University of Baltimore School of Law. During law school, David was a student attorney for the University’s Family Law Clinic, where he argued cases for economically disadvantaged clients in District Court, Circuit Court and the Court of Special Appeals. He also participated in a campaign to reform Maryland’s domestic violence laws, and was part of a delegation that testified before the General Assembly to change those laws. David also interned for the Honorable Wanda Keyes Heard at the Circuit Court for Baltimore City and for the Towson law firm of Warnken, LLC. After graduating with a Juris Doctor from Law School, David was selected to clerk for Special Master Andrea F. Kelly at the Circuit Court for Baltimore City, Family Law Division. After his clerkship, he was recruited by his former law school professor Byron L. Warnken to be attorney-in-charge of the firm’s, family law and workers’ compensation practices. In 2010, David decided to pursue his dream of opening his own law firm. He believed that in starting his own law practice, he could more effectively represent his clients’ varied legal needs. Today David’s law practice focuses on family law, workers’ compensation, criminal law, estate planning, Law Enforcement Officers’ Bill of Rights (LEOBR) and general civil matters. David has represented the Maryland Troopers Association and numerous police officers in internal affairs investigations. David Nowak is a Baltimore area marijuana defense attorney. He provides consultation for businesses interested in legal and business consequences of the marijuana industry in Maryland. David is a certified mediator and a Certified Best Interest Attorney representing children in highly contested custody and divorce cases. The Court frequently appoints David as child’s counsel. David continues to be active in the Baltimore County Bar Association, the Baltimore City Bar Association, the Maryland State Bar Association, the Maryland Association for Justice, the American Bar Association, the Maryland Criminal Defense Attorneys Bar Association and he is active in his local community organizations. 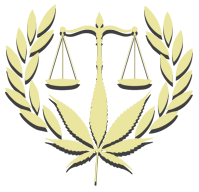 Contact a Baltimore Marijuana Defense Lawyer today if you have been charged with pot possession. We provide experienced and compassionate representation. We offer a free phone consultation.